Hello, derby fans! It feels like every month we say that this past bout was the most exciting bout we’ve seen in a long time, and it feels that way every time! The competition in Atlanta is so hot this year that it’s hard to pick a favorite! Game 1 gave us consistent lead changes and a final jam that could have gone either way, and Game 2 saw huge hits, fast packs and long jammer take-backs. I played in both games, so I may be biased, but if you weren’t at Shriner’s this past weekend, you missed two great games! I’m Rosie Derivator and let me recap them for you! The Denim Demons opened up the evening hot, creating a 22-8 gap within the first few jams. Not to be outdone, however, The Sake Tuyas came back swinging, taking the lead back, 29-24. Lead changes went back and forth, as Human Missle Crisis and Turbo Royale proved why they’re frequently named MVP Jammers. Strong utility skater Cancer Candy dominated in both roles, and helped bring the Demons on top to reach the half, 85-54. The Sakes came back from half time with renewed vigor. Rumble B, Tallahassee transfer, and temporary Sake Gucci Maim took the Demons by storm, not only closing the gap but taking the lead back, bringing the Sakes to 111 for the Demons’ 101. 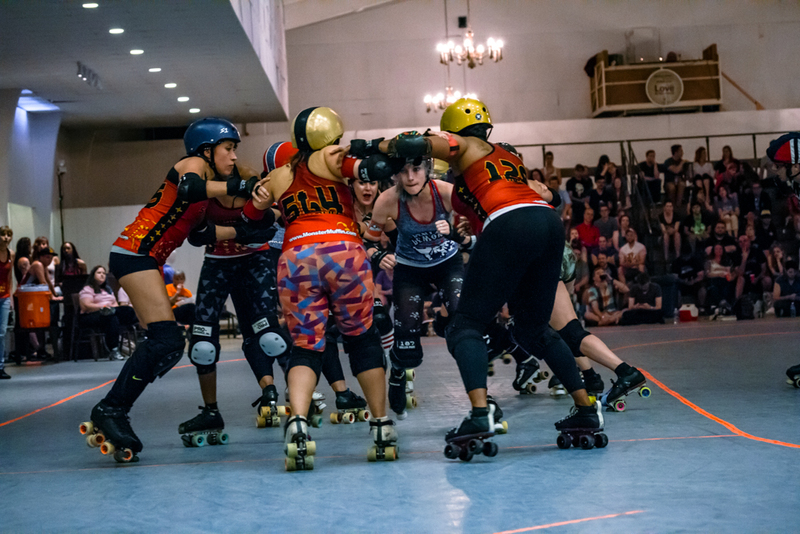 Hard hitting and consistant recycling by Sake defensive powerhouses Lux Furious and Saikou made the Demons’ jammers work hard for every point scored, but the ladies in denim were determined to take their second win of the season. An unanswered 18-point run brought the Sakes within the grasp of victory, but the Demons held strong for the win, 175-166. Your home town Rumble Bs have been working hard in prep for Tiny Tourney and another run at Bs Champs, as evident in their out-of-the gate-swinging start for their debut home game. 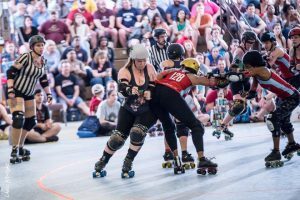 An unanswered 19-point first jam was only the beginning of the scoring spree that the Bs were about to go on, their defense allowing the Greenville Derby Dames as few lead-jammer calls as possible. Slow, strong tripods with Koko, Revelyn Sin and Mad Villain dominated on the track. Trauma Queen and Baconator put up strong fights, but were only able to score 14 points for their team by halftime. Bs went into the second half ahead, 260-14. The last 30 minutes of the game saw a revival of the Dames, with heavy offensive sweeps and big changes to the jammer lineup. 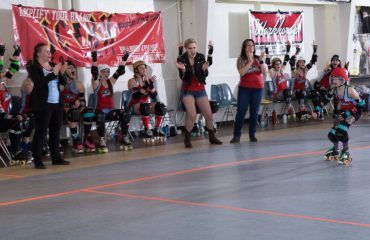 Steady in the previous half blocker rotation, Asphalt and Baconator were the jamming combination that Greenville needed to see their points quadruple before the final whistle. Apex jumps and hard hitting off the jammer line from the Dames obviously took the Rumble Bs defense out of their comfort zone. Turbo Royale and Evil Olive, however, took advantage of the split focus of the Greenville packs and continued to put points on the board. A final surge from Greenville kept the Bs on their toes, but could not close the gap. 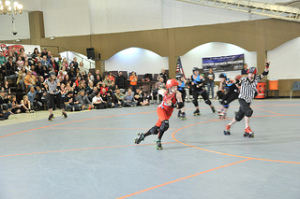 Rumble Bs take the win with 446 to the Dames’ 50. Come watch both the Rumble Bs and the Dirty South Derby Girls at home next month in Atlanta’s very own Tiny Tourney! Montreal is bringing both their A team and B team for an entire evening of Canadian awesomeness at your regularly scheduled times, and those are only 2 of the 12 games all weekend! See more info HERE or stand by for an upcoming blog post with everything you need!